I went to Buckingham Palace last week to meet the Queen and collect my MBE and she turned out to be remarkably like Prince Charles. I was looking forward to the visit because I had heard there were a lot of footmen there and I reckoned that was just the place to sort out my ongoing injury problem writes Joe Quinn. But apart from telling me to keep moving and to take stuff out of my pockets they didn’t say anything about feet at all. The thought occurred to me as I made my way through the huge corridors resplendent with priceless artwork, that it would make an excellent indoor running track – they wouldn’t let me try it out either! While I was recovering from that ordeal my much faster and two footed East Down colleagues Brendan Teer 4th, Neil McCartan 22nd, Martin Willcox 27th and Barrie Atkinson 29th were claiming 3rd place at Kilbroney Park in Rostrevor in the first round of the Cross Country League, with Peter Morgan and Stephen McCartan picking up a valuable bonus point for making it a six man team. At the same venue there was an encouraging turnout in the Age Group races with debut girl Edie Carroll leading the way in the Under-12 Girls category, followed closely by Natasha Savage, Beth Watterson, Aoife Burke, Ellen Boyd, Mary-Jo Tumelty and Louise Byrne. In the Boys equivalent Caoilin Quinn produced a tremendous run to take 12th place and qualify for the All Ireland finals to be held in Ratoath, Co. Meath on 25 November. Johnny Erskine was the only other East Down runner in that group and as ever ran his heart out. Andrew McGrattan and James Byrne had set the Club’s challenge in motion in the Boys Under-10 race, both performing well over a tough but well appointed course. A quartet from the County town club competed very well in the Under-14 Girls event, led home by Laura Green and closely followed by Aoife Cochrane, Olivia Mooney and another debutante Ella Carroll. There was also a foursome in the Boys race with Christopher O’Connor mastering the conditions best taking 55th place in a huge field, ahead of Daniel Atkinson 61st, Tim Prenter 63rd and Owen Edwards 71st all separated by just 40 seconds. The Girl’s Under-16 race provided the overall best results of the day as Ellen Erskine followed Caoilin’s example and also qualified in 12th place for All Ireland participation. Laura Gardiner gave a good account of herself in 28th place while Molly Rice, Chloe Daly and Alex Bell completed the quintet. In the Boys Under-16 race there was a trio from the Club, Paddy Erskine doing best in 36th with Tom McMeekin 39th and Sean Murphy 63rd. Matthew Tumelty was a lone representative in the tough Under 18 race and can be proud of his efforts. The following Monday all roads led to Dublin for the Marathon, a now traditional outing on the last Monday in October, where ideal conditions greeted the 14,000 plus participants as they gathered for the 9.00am start. This was an hour earlier than last year and made the task of the support crew, whose job it is to ensure that there is no food left in the dining room after the runners have departed, a bit more difficult as there was less time to “tidy up”. Having earlier erected the Club banners across the motorway footbridge at around the 22 mile mark, there was nothing left to do but head for Kilmainham and wait for leaders. 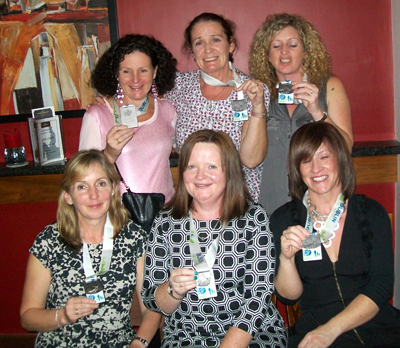 Jackie Moore, Murlough AC, Bernice McCann and Sheena McKermitt, and front row l-r, Linda Cunningham, Oonagh Cochrane and Kim Surginor with their Dublin finishers medals. There were only half last year’s runners from the Club but as ever the fundamental aim was to finish, times were important to some admittedly, but ultimately it was crossing the finish line which was the ultimate objective for all. First, as in the past number of years, came Philip Vint, going well at 10 miles but unforgivably let down by his drinks carrying duo at 20 miles, he succumbed to cramp in the last 4 miles. Although forced to slow down he crossed the line in a splendid 3.01, not his best but 1 minute better than last year and a time to be proud of. Next in a terrific personal best was Michael McKeown, in the best form of his life, clocking in at 3.08. Next Down man home was distance debutant Jeff Breen, recording a superb 3.16 to really set his standard for the future, a sub 3 hours is surely just a matter of time. You’re supposed to be tired at the end Jeff, not looking for the second lap! Personal bests too for Michael Cultra 3.26 improving with every outing and Gavin Oakes 3.29 a controlled performance in preparation for the New York event, since sadly but rightly cancelled due to the effects of Hurricane Sandy. Raymond Milligan made his usual storming start reaching halfway in 1.44, but paid dearly for his early exuberance. However his 3.49 is not to be sniffed at. John Findlay romped home in 3.53 while wife Wendy looked at ease all the way finishing in 4.03. And this was when the Ladies began to exert their influence on the occasion, with Kim Surginor nailing 3.57 and Oonagh Breteche following her pace instincts to crash through the 4 hour barrier in 3.59. Michael Degan ran a splendidly judged race in 4.05 while Linda Cunningham stuck with the Master Paceman, Simon McGrattan, to record 4.13 and before the joyous arrival of her sister Sheena in 4.57. Brian Donnelly had a tough time after suffering an Achilles injury a long way out but completed unperturbed in 4.37. Pride of place in spite of all these excellent results – remember everyone did a personal best for that day – must surely go to Oonagh Cochrane who only took up running a year ago, suffered badly from cramps from halfway but battled on to record 5.24, a truly inspirational effort, in her first marathon, and also raised over £1000 for the Chest, Heart and Stroke Association in the process. This despite the close attention of James Magennis, who was to memorably burst into song at around the 25 mile mark, but who nevertheless provided magnificent support throughout. And a final marathon word on the lovely and truly dedicated Bernice McCann who ran what she says was her final marathon, content now to stick with the Half distance. Well Done to you Bernice you have been an inspiration to everyone in the Club over many years for your resolute determination and never give in attitude. Good Luck with the Half’Ns . The week after a marathon is always one to look forward to as the experts recommend a complete rest and break from training so I have enjoyed the relaxation like everyone else – after all spectators need to re-charge their batteries too! On Saturday it was back to cross country action with the 2nd League fixture in Ballyclare, run in conjunction with the 78th McConnell Shield race. East Down fielded a strong team though with only minimum numbers and could be well pleased with their performance over the 5 mile distance. Brendan Teer ran a very clever race, sitting with the lead group, as far back as 10th at end of lap 1, slowly working his way through the pack to lie 5th with a lap to go and then finishing strongly to grab 3rd at the line. Barrie Atkinson ran well despite suffering from a heavy cold and Mark McDowell was delighted with his placing in a strong field. Stephen McCartan battled all the way with his adversaries from Kilbroney and provided the crucial points clincher. On 25 November local interest will focus on Raholp where this year’s Round the Griddle 10K and Fun Run gets under way at 12 noon from Saul GAC premises.